Photocatalytic technology offers the potential to provide renewable hydrogen by solar-driven water splitting or to produce hydrocarbons directly from sunlight, water and CO2. However, the low charge-separation efficiency due to the lack of directional driving forces strongly limits the solar-to-hydrogen efficiency or, more generally, the solar-to-fuel efficiency. Thus the understanding and exploring the driving force for charge separation is key to improving the photocatalytic performance. A research group led by Prof. 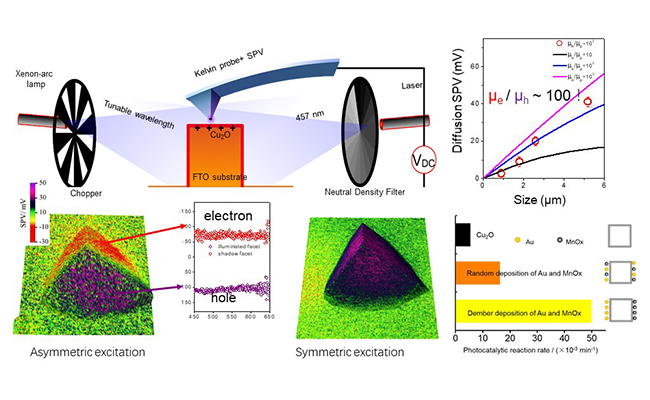 FAN Fengtao and Prof. LI Can from the Dalian Institute of Chemical Physics (DICP) of the Chinese Academy of Sciences, using surface photovoltage microscopy (SPVM), demonstrated that the photogenerated charges can be separated effectively in a high-symmetry Cu2O photocatalyst particle by asymmetric light irradiation. The quantitative studies combined with theoretical simulations reveal that the huge difference of electron and hole mobilities (100-fold) is responsible for the asymmetric illumination-induced charge separation. Using this effect, the asymmetric cocatalysts assembly can be achieved on a single photocatalytic particle, leading to a significant improvement of photocatalytic performance. These directional driving forces can improve the charge separation efficiency of photocatalysts and, in the future, may be applied in the context of solar water splitting or CO2 reduction to increase the efficiency of solar fuel production.